Sprained ankles are common injuries that usually happen after you have twisted or rolled on your ankle. This can stretch or tear the ligaments, the strong bands of tissue that hold the bones in your ankle and foot in position. A sprained ankle can cause pain, swelling, tenderness, and bruising. It might be difficult to move your ankle in all directions. If the sprain is severe, you might not be able to walk. 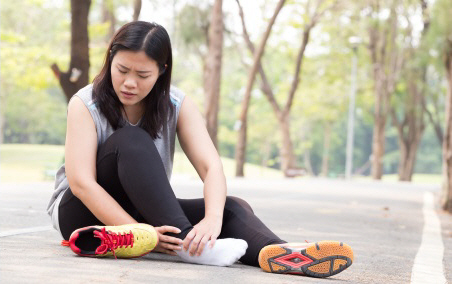 For bad sprains it's best to see a doctor or physiotherapist as soon as possible, as getting the right treatment straight away may mean you recover more quickly. You should see them if you have difficulty walking or putting any weight onto your ankle, if your ankle is deformed or giving way, or if you are worried. You may need an X-ray to check you don't have a broken ankle. What should I do to help my ankle heal? There are things you can do yourself to help your ankle heal. Acting quickly helps to reduce the swelling (and inflammation) and keep you moving as freely as possible. Get started as soon as possible on what's called RICE treatment. (RICE stands for rest, ice, compression, and elevation). You may need crutches or splints to rest your ankle. Pain relief such as paracetamol or ibuprofen can help to make you more comfortable, although it doesn't seem to change how quickly you heal. Talk to your pharmacist if you're not sure what you are safe to take. In the first 72 hours, remember what NOT to do as HARM – Heat, Alcohol, Run, Massage. As the swelling starts to come down, do some regular exercises to help keep your ankle mobile. It can stiffen up if you don't exercise it. Download this sheet from ACC describing exercises that will help. You may need time off work depending how severe the sprain is, and what job you do. A physiotherapist can help with your rehabilitation. ACC may help to pay for this.